Kennedy's Lasting Devotion To Health Care For All The late Edward Kennedy was a liberal powerhouse for changing the nation's health care system. Though he died before he was able to realize his goal of providing health insurance for every American, he pushed through many health care bills in his lengthy Senate career. 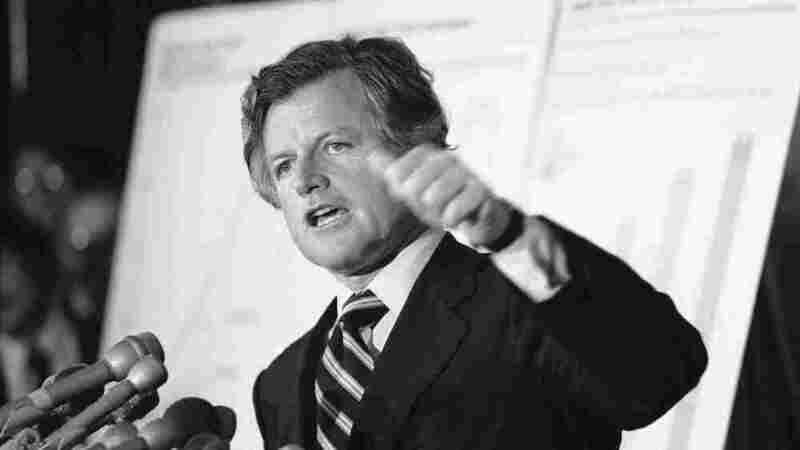 Health care had long been a defining issue for Sen. Edward Kennedy, who died Tuesday at age 77. It was perhaps his biggest legislative disappointment that he hadn't managed to realize the goal of providing health insurance for every American. But along the way, he left a major mark on the nation's health care system. The list of health care bills written or sponsored or somehow negotiated by Kennedy over his senate career literally fills books. He expanded children's health insurance coverage; he provided funding to fight HIV and AIDS. He crafted policies to protect the nation from bioterrorism. He was basically a one-man health-policy history lesson. "There is really no one who comes close, not even 10 percent close to what Sen. Kennedy has done and what he stood for," says Stuart Altman, a Brandeis University professor and economist who advised presidents Nixon and Clinton and presidential candidate Obama on federal health care policy. Even before he was elected to the Senate, Kennedy was advocating for better health care coverage. In a campaign ad in 1962, he said, "Too many of our senior citizens are being forced to choose between neglecting their ailments or being pauperized by them." In this 1962 campaign ad, a youthful Ted Kennedy interviewed Lynn, Mass., resident Helen Clancy about her health care costs. After he won the Senate seat originally left vacant when older brother John was elected president, Kennedy pushed for the passage of Medicare. A few years later, he pushed for the expansion of what was a relatively small health program created as part of Lyndon Johnson's War on Poverty. Today, the community health centers program serves some 16 million Americans, many of whom have low incomes or no insurance. By the 1970s, Kennedy had become a force to be reckoned with in health care. David Blumenthal, who now works in the Obama administration, worked for Kennedy in those days. He said Kennedy liked issues that would bring publicity — particularly because he still harbored hopes of running for president. "But he wasn't just about cameras," Blumenthal says. "He was also about long hearings about biomedical research, long hearings about how to prevent illness, long hearings on technology and its effect on health care and how to measure it and evaluate it." And despite his reputation as a far-left liberal, as a legislator Kennedy was always ready to look for a compromise. In the early 1970s, Kennedy secretly sent his top aides to meet with Altman in a church basement near the Capitol. Altman was working for Nixon, trying to draft a national health insurance plan. At that point, Kennedy was pushing for a fully government-run plan, while Nixon wanted to require employers to provide private coverage. But Altman says Kennedy was willing to try to find common ground. "The problem, of course, is that Kennedy was way out in front of his more liberal compatriots, and we were way out in front of the more conservative, and ultimately the whole thing blew apart," Altman says. "But it impressed on me that at the end of the day, Sen. Kennedy wanted to make changes that helped people, and if that meant moving away from his preferred position to a compromise, he was willing to do it." In 1980, Kennedy failed to defeat President Carter in the primaries and lost what would be his last chance to become president. That autumn, he also lost his legislative power when the Republicans took over the Senate. But Kennedy managed to adapt once again. This time he forged a most unlikely alliance with conservative Utah Republican Orrin Hatch, who became the new chairman of Kennedy's committee. They remained not only legislative allies but also firm friends to the end. "There's a brotherhood there. We're like brothers. And I truly love the guy. Now, that doesn't mean I agree with him. But I do love him," Hatch said in an interview just after Kennedy was diagnosed with brain cancer. Together in the 1980s and '90s, the two teamed up to pass landmark legislation including the Ryan White AIDS law and the children's health insurance program, and bills to streamline drug approvals at the Food and Drug Administration, among others. "We've been a very active and successful team," Hatch said. "We've covered the universe from the left to the right." Kennedy, however, wasn't willing to compromise his fundamental beliefs. In 2003, he voted for the initial version of a Medicare prescription drug bill, to advance a cause he had been pursuing for years. But he was furious that the final version was too favorable to the drug and insurance companies. "Who do you trust to fix the Medicare program: the HMO-coddling, the drug company-loving, the Medicare-destroying, the Social Security-hating Bush administration? Or do you trust Democrats, who created Medicare and will fight to defend it every day, every week, every month and every year?" Kennedy didn't always win — he spent nearly a decade trying in vain to pass a so-called patients bill of rights, only so see it fall just short. But usually his persistence paid off in the end. For example, when Democrats took the Senate back in 2007, Kennedy made up for lost time. He steered through two bills that had each languished for more than a decade. One banned insurance discrimination based on a person's genetic makeup; the other required insurers to provide the same level of coverage for mental as for physical ailments. "This is a season of hope ... and this is the cause of my life, new hope that we will break the old gridlock and guarantee that every American — north, south, east, west, young, old — will have decent quality health care as a fundamental right and not a privilege." Kennedy returned to Washington on and off in the early part of the Obama administration. He was an early and strong supporter of the new president. But he did not live long enough to see that final dream realized.